Shade tolerant, pest and disease free, astilbe is a gardener's dream plant. Meet a few of an astilbe's cultural requirements, and this easy care perennial will add beauty with its feathery plumed blossoms during the summer months. When it is not in bloom, it adds a background of fern-like foliage to the garden. The flowers dry on the stalk if left, and add winter interest to the garden. The first time I saw an astilbe flower was in a bridal bouquet of white flowers. The florist artfully intertwined lace and astilbes around white rosebuds. Its simplicity and monochromatic white tones made a wonderfully romantic, airy bouquet. I asked the florist the name of the flower and sought it out in the nursery trade. A lesser-known plant back then, it was hard for me to find at the local nurseries. After searching, I located one called 'Ostrich Plume'. Salmon pink and rising to four feet tall, the twelve I ordered soon filled the bed with their feathery plumes. I lost the plant tags years ago and do not remember many of the astilbes' official names in my old collection. Back when I first grew them, I did not keep records as I do now. I still have many divisions from the first plants I planted and have given many of them away to other people, who enjoy my small collection and ask where to find them. Nowadays you can find hundreds of varieties. Careful selection can give you a succession of flowers from early summer into late summer. Tall and short varieties can be found in almost every nursery. 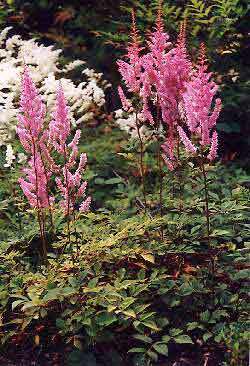 Astilbes come in numerous colors such as red, burgundy, peach, lavender, pink, cream or white. By carefully selecting the right site, you will findastilbe is a care free perennial. I find open shade in a moist, humus rich soil suits it best. Growing in full sun requires a greater amount of watering to keep the plant thriving, and the flowers fade quicker. I side dress with compost and/or manure every year and keep a layer of shredded bark mulch around the plants to retain moisture. Once established, it holds its own in the shade garden. If the garden does not receive an inch of rain a week, I will supplement water during our summer drought season. Every third year, the plant is lifted out of the ground and divided. The woody crown requires a sharp shovel to slice through the roots, but other than that, it divides easily. You can divide in early spring or late fall. I prefer fall for dividing to give the plant a chance to settle in its roots before the next growing season. I add compost and/or manure at time of replanting and mulch well. Astilbes attract many pollinators, which work over the tiny flowers on the plumes. My first planting was close to a main walkway. What a nightmare it was for people, timid about bees, to walk by the plants swarming with them. It did not bother me, but I eventually moved the astilbes away from the walkway to ease the discomfort to those passing by. Enjoy the many cultivars of astilbes; many are in the Plant Gallery and Growing Guide for your perusal.